Discussion in 'Video Cards' started by erek, Mar 19, 2019. Red Falcon, DejaWiz, AlexisRO and 4 others like this. - VS100 was too late to market. It should be direct competition to Riva TNT2 instead of Voodoo3. Voodoo4 performance suggests it was supposed to be just that. Armenius and erek like this. Is there a English version of the first article? Google translate chopped it up. Instead of getting nostalgic I get anxiety with these articles. Seriously, tech back then when was so difficult to work with and I got many scars on my hands from being cut up in my old beige PC cases, lol. Factum was just wondering how many people reading that article were PC gaming when it all unfolded. 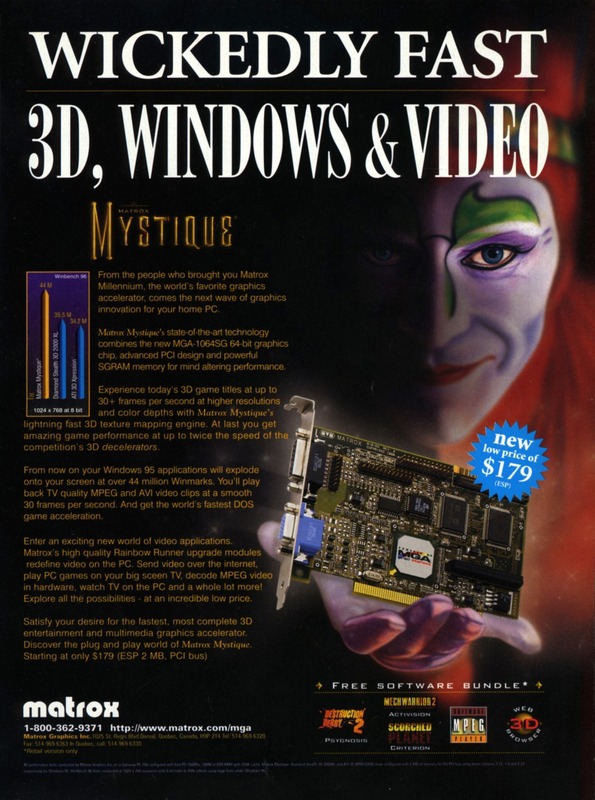 I still remember moving from an integrated Cirrus Logic VGA adapter to a Matrox Mystique to an i740 to Voodoo2. "Those were the days...."
Axdrenalin and auntjemima like this. Iirc Ars had a similar article a few years ago. Oh yeah...or trying to load VESA fixes in config.sys to make a S3 Trio+ VESA 2.0 compatible...and hoping you had not put the card in a slot which caused an IRQ conflict...I had Amiga's before PC's...those were more...."human" to work on. auntjemima and deruberhanyok like this. After my frustrating run with a Rendition Verite 2200 and a 3Dfx Voodoo Rush 6MB, I eventually moved on to a single (and shortly after an SLI) Voodoo2 setup. Wow, what a difference! 1024x768 3D gaming was amazing! I eventually paired that V2 SLI setup it with a TnT2 Ultra 32MB. One day while tinkering around just for the hell of it, the game "Kingpin" was the first time that I used the TnT2 for 3D rendering duties, and was instantly impressed with the performance and visual quality vs 3Dfx. Factum, Auer, erek and 1 other person like this. No name vga -> ET-6000 + Voodoo Graphics->Wicked3d Voodoo II + i740-> Voodoo 3.